This wouldn’t be the first time that you will see a home that is full of luxury. This wouldn’t be the first time you will see a home with a huge pool area making you feel like you are always on vacation all the time. Well, the house that we will feature today would just be a few of those home spaces that have a lavish design both inside and out. We have featured some homes similar to this before but of course, this has a different design. 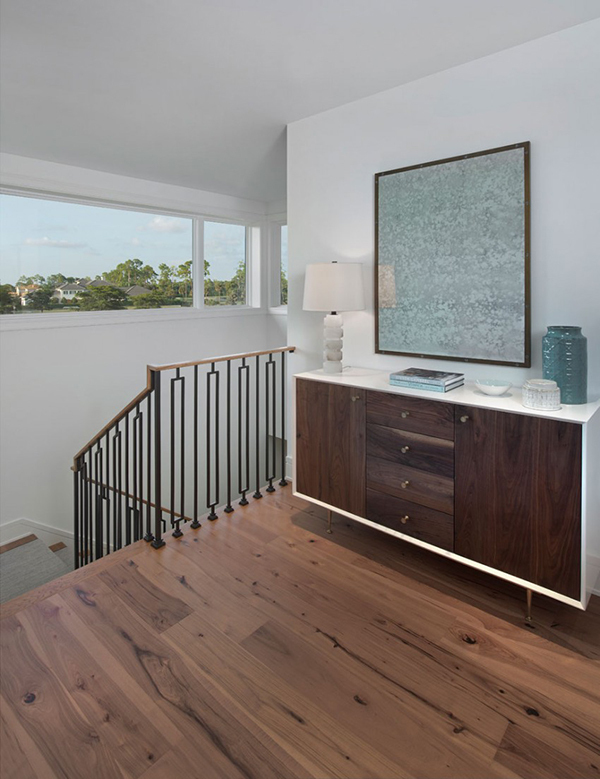 A gorgeous home called the Estuary Custom 4 is considered a high-end contemporary residence designed by Harwick Homes. 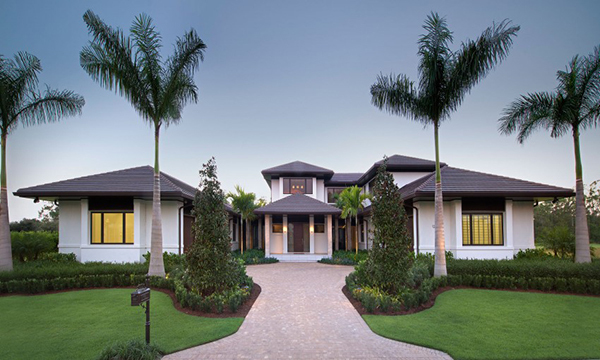 This stunning luxurious home is located in Naples, a small city in Florida, USA. Well, small city that is but this grand house is nestled in this place where you can see sophistication in every inch of it. When you see the home’s exterior, you will immediately get a clue that something amazing awaits inside it. And you are about to see that in the images below. The does look a bit formal from outside and when I say formal, you will feel like you have to remove your shoes when you get in. Lol. But it isn’t just the curb appeal that is stunning for the home but also this central pool area. I also like how they added trees into the pool area giving it that tropical feel. The interior of the house is equally stunning. It has a white coffered ceiling and you can see different textures around it. That woman underwater seems legit but it is merely a wall decor that adds coolness to the aura of the living room. 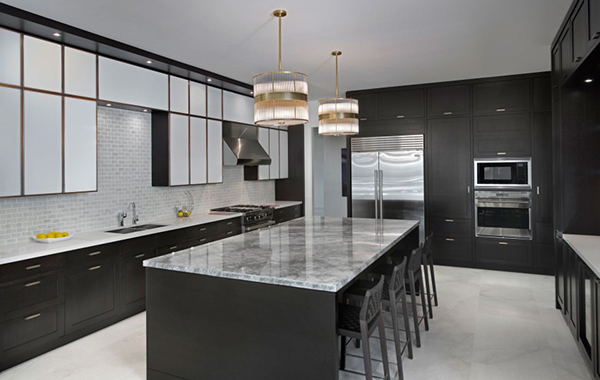 The kitchen in black and gray color looks formal and totally neat. 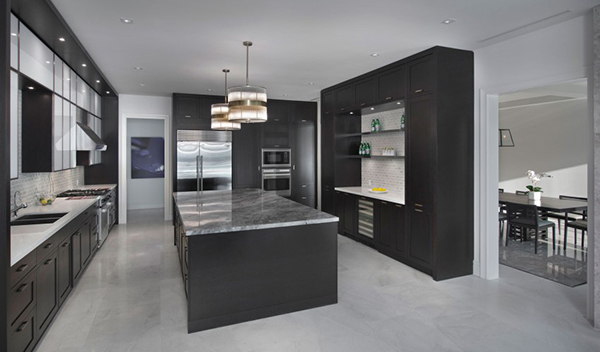 Note the use of white tiles on the backsplash as well as marble for the countertop of the kitchen island. The dining area is a lovely space to eat and even chat with friends. The centerpiece looks very refreshing. 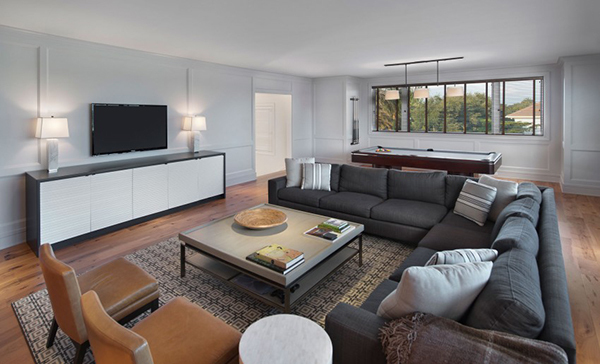 This is the family room with comfy furniture to curl up and watch a movie. 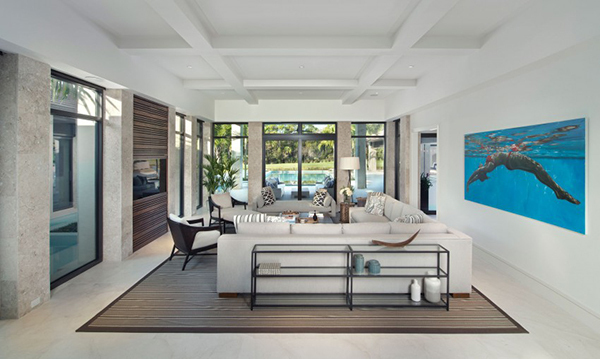 Note how the area rug added graphic appeal to this space. 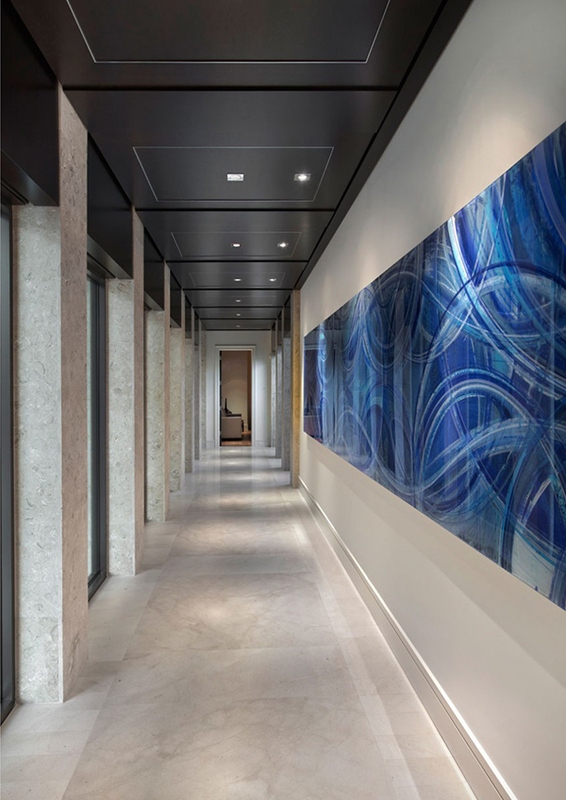 Who says a hallway is boring? Well, this one sure isn’t! Just look at the ceiling, lights, columns and that eye-catching wall art. Coffered ceiling is used for the bedroom too. This bedroom opens up to a balcony where the owners can get fresh air. When one reaches the second level of the house, this is how the landing looks like. 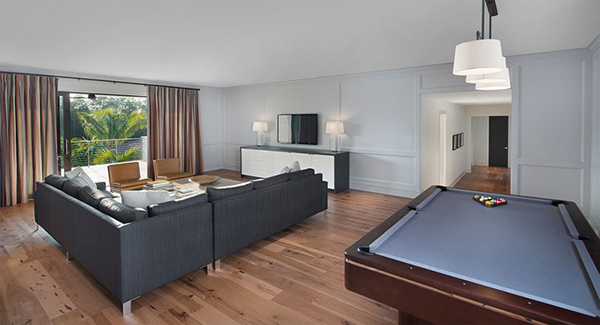 The family room also have a billiard table for fun and entertainment. You’d really be attracted to the pool area especially when the lights are on like this one! On one side of the house is this space where you can see an extension of the pool waters. Now this is indeed a pool area to die for! I’d love to have one like this! Lovely. Just lovely. 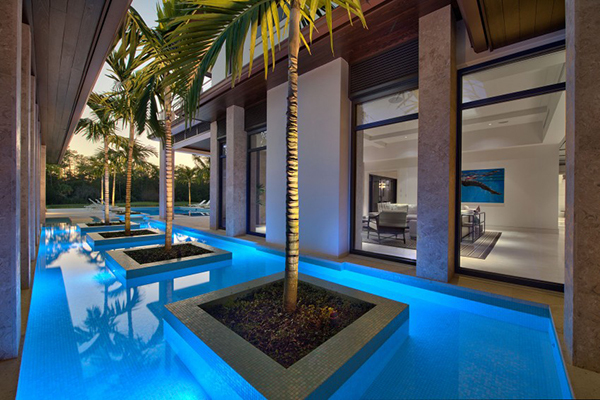 I like the swimming pool area of all the spaces especially when it is lighted. The drama is just unbearable and is something that we all want to see in our very own homes. Well, I’d say this is a job well done for Harwick Homes because of how the home turned out to be. It is indeed a stunning residence. It is like a paradise of their own and a place they can come home to as if they are always on a holiday. Like this home? Why don’t you share it with friends too?